From the outside, the Uniden Bearcat 80XLT and the almost identical COM-213 look like the BC60XLT-1 en 60XLT-2. The inside however is different, and looks more like the interior of the 120XLT/220XLT. 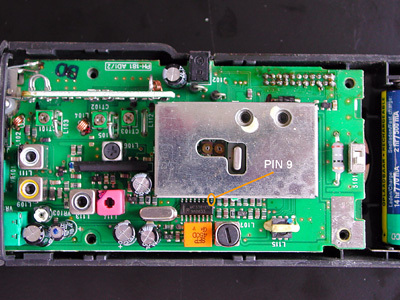 The scanner uses an SMD MC3361 receiver IC, with the baseband signal at pin 9. This pin is rather hard to reach, so better use a soldering iron with a fine tip. A 10 k resistor is connected to pin 9 of the IC. As usual with the MC3361, the discriminator output contains a rather strong IF component at 455 kHz. A 2.2 nF capacitor is connected to the other lead of the resistor. The other side of the capacitor is connected to the metal shield. This creates a simple lowpass filter with a cutoff frequency of approximately 7 kHz. The IF component is suppressed effectively. A 3.5 mm chassis terminal is mounted in the back of the scanner. Its ground lug is connected to the battery contact nearby. 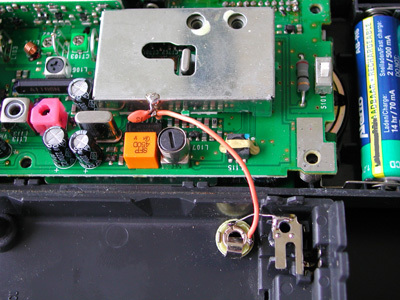 When the scanner is put back together, this contact is connected to the PCB's ground. 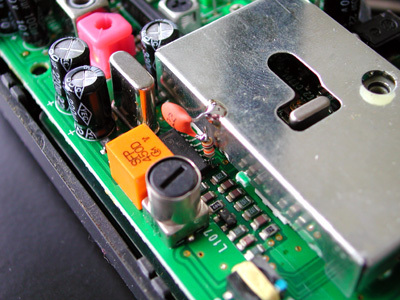 A small piece of insulated wire connects the junction of the resistor and the capacitor with the other lug of the chassis terminal.